Nice & cosy studio in the heart of Korinthos, just 150m from the beach. Situated in a calm walking with nice coffee shops, a few minutes from the shopping area, fresh fruit, fish and meat markets an street a small family beach in 3min distance. The main room has a very comfortable sofa bed allows two people to sleep. One private Bathroom with shower WC. Kitchen, fully equipped. In case that there is a third person staying with you there is an extra folding cot bed. There will be fresh bed linen and towels for you to use. You will find plenty of plates, cups, pots and pans at your disposal. We just want to make you feel home. There is a train which leaves the airport of Athens every hour. The trip to Korinthos takes approximately 1 hour. The adult fare is €9 single. Taxis are always waiting outside the station. Cost 5 euro. First train is at 5:44h and last at 21:44h. From our place you can walk to the Kalamia beach, the main beach of Korinthos. It will take you like 10-15 min. There you can find nice coffee shops and restaurants. Please note that every Saturday there is a big market, next to the big church of Agios Georgios, starting at 9 am till 13 -14h. You can find everything there - fresh fruits and vegetables, fish, clothes etc. Also on the street, passing just in front of the building, there are many shops open in the morning selling fresh fruits and vegetables, fish and bread. Please note that they are open only in the morning till 14H. There is a big supermarket VASILOPOULOS in a few minutes from our place. Conveniently situated 80km from Athens, Corinth is the gateway to the Peloponnese, an area rich in natural beauty and historical sites. Ancient Corinth is an important archaeological site, and above the ancient town towers Acrocorinth, a fortress used throughout the middle ages by Byzantine, Venetian and Turkish occupiers. The modern city of Corinth has all the facilities to make your stay enjoyable, including numerous outdoor cafes, bars and restaurants, several beaches, and services such as travel agencies, banks and shops. It easily charms everyone with its little cube houses with flat-roofed houses and its narrow stone paved streets winding like a labyrinth of white lines traditionally painted around the large flat stones; arches and arcades are merging from a street or between two houses and contribute to the creation of a wonderful and magical atmosphere. and frequent trains and buses connecting Corinth to the surrounding villages. 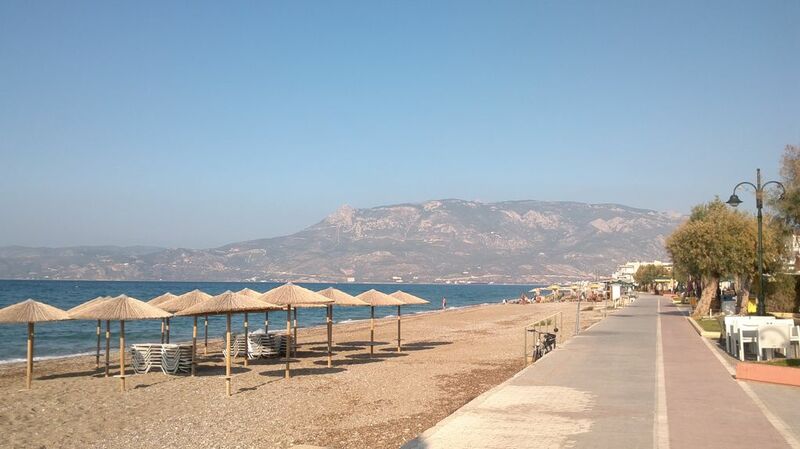 Corinth is an excellent base for touring, set among many unspoilt beach resorts. Loutraki is a spa town renowned for its clear blue sea. Vrahati is one of the many smaller coastal villages that combine relaxing days on the beach with vibrant nightlife. The stunning sites of Mycenae, Argos, Nafplio and Nemea are all close by, as is the theatre of Epidavros, where ancient tragedies are performed during the summer festival. Please smoke on the balcony only. The smoking in the apartment is not allowed. eine saubere wohnung, in der alles notwenige vorhanden ist. lage an einer belebten straße - drei minuten zum strand, direkt an der fußgängerzone mit vielen läden und bars, 10 minuten zum busbahnhof. sehr freundliche vermieter, die schon bei den zugverbindungen für unsere anreise behilflich waren und immer sehr schnell auf unsere fragen reagiert haben. mit dem abholen vom bahnhof und einem trip zum kanal von korinth haben sie uns einen wunderschönen empfang bereitet - dafür noch einmal vielen dank ! Conveniently situated 80km from Athens, Corinth is the gateway to the Peloponnese, an area rich in natural beauty and historical sites. Ancient Corinth is an important archaeological site, and above the ancient town towers Acrocorinth, a fortress used throughout the middle ages by Byzantine, Venetian and Turkish occupiers. The modern city of Corinth has all the facilities to make your stay enjoyable, including numerous outdoor cafes, bars and restaurants, several beaches, and services such as travel agencies, banks and shops. It easily charms everyone with its little cube houses with flat-roofed houses and its narrow stone paved streets winding like a labyrinth of white lines traditionally painted around the large flat stones; arches and arcades are merging from a street or between two houses and contribute to the creation of a wonderful and magical atmosphere. and frequent trains and buses connecting Corinth to the surrounding villages. Corinth is an excellent base for touring, set among many unspoilt beach resorts. Loutraki is a spa town renowned for its clear blue sea. Vrahati is one of the many smaller coastal villages that combine relaxing days on the beach with vibrant nightlife. The stunning sites of Mycenae, Argos, Nafplio and Nemea are all close by, as is the theatre of Epidavros, where ancient tragedies are performed during the summer festival.